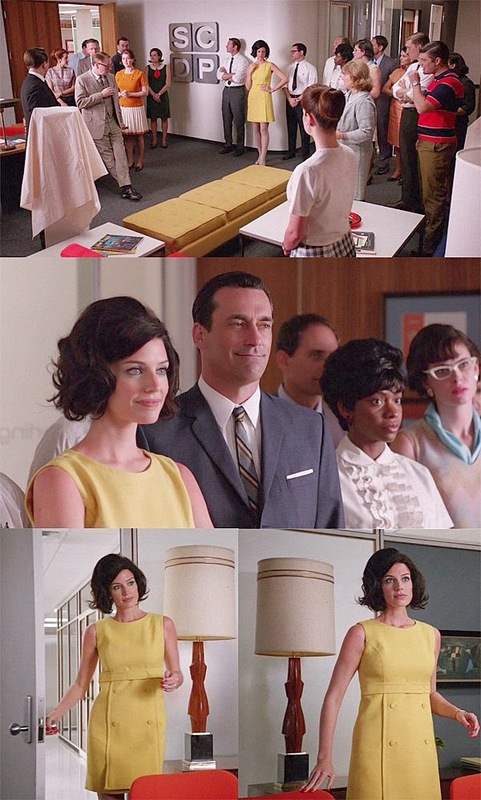 Fabric Mart Fabricistas: Mad Men Challenge Submission Finished! Fabric: I looked through my stash for a solid fabric. But I didn't have any that I thought would work well for this dress. (You're probably wondering why I didn't look for something from Fabric Mart?! Well I have a lot of my own stash to use up and forced myself to not bring more fabric home!) I came across a very retro floral linen from Anna Sui. I really liked the fabric but never really knew what I would make with it. This challenge seemed like the perfect time to use it! Since I picked a print for the main part of the dress, I wanted to tone down the print just a little bit. 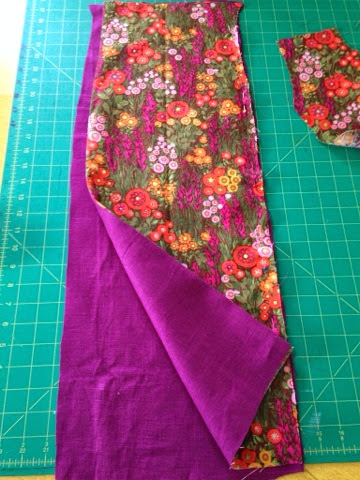 So I found a close matching linen in my stash to use inside the skort and on the front band. Pattern: I used Simplicity 2146. I had the pattern in my stash, and just like the fabric, wanted to use something I already owned. This pattern was almost spot on! With a few simple alterations, I was able to make my version of the yellow shift dress. I used the bottom half of the front as a pattern to cut out two solid pieces, which would help make the skort. 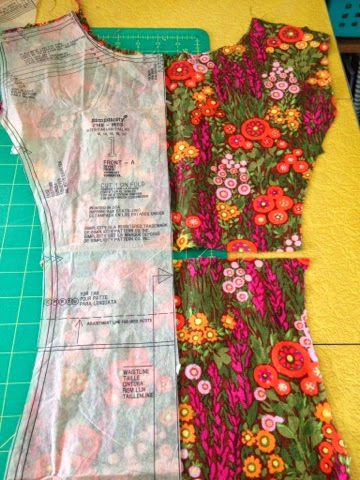 With right sides together, I took one of the solid bottom pieces and the floral bottom piece and sewed them together along the long, un-notched side. I would have sewn the hemline, but I didn't know how long I wanted the hem to be. 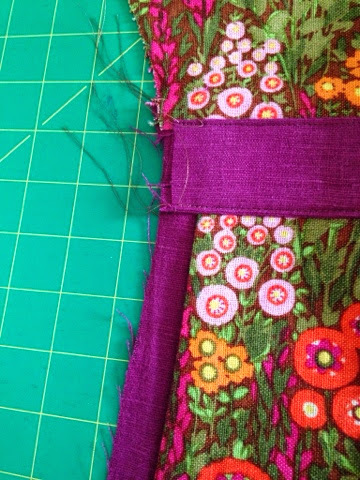 I pressed the seam open, then turned right sides out and basted the top and long, notched edge. I also pressed the finished edge to get a nice clean look. I laid the wrong side of the skort piece on top of the right side of the other solid bottom front, then basted them together along the top and left notched edge. You can see here that the skort section is about 3/4 inch shorter than the bottom piece. This is intentional because you don't want the skort piece to get caught when you sew the dress together. 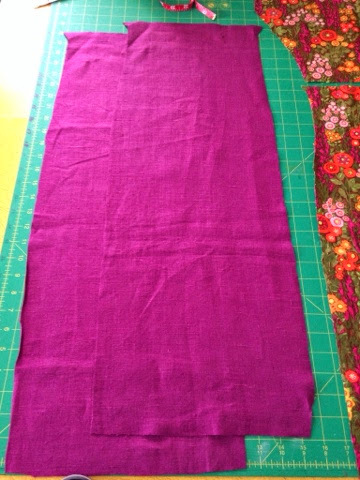 Sew the top half of "front" to the skort/bottom section. This is now the main "front" piece. Press the seam down. Attach the front tab on top of the seam. This is a great way to hide what you just did! 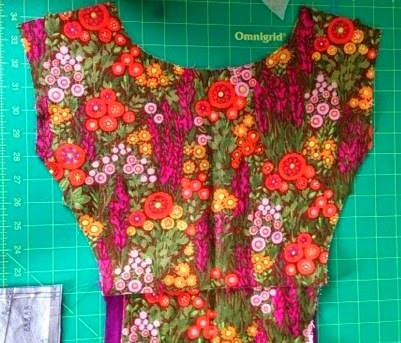 Sew the rest of the dress like usual! After sewing the dress together, I sewed the skort down at the side, about 4-5 inches. This helps keep the skort in place. I also added a few buttons to that area to make it look like the buttons are holding the skort together. I made size 16, but probably should have done a Full Bust Adjustment because the bust area was too baggy between my chest and shoulders. (A common problem.) I chose not to do a FBA because of time restraints. Because it was princess seams and I wasn't attaching sleeves, it was really easy to fix the gap. I took the top of the princess seams apart of pulled in the side front pieces to where it felt comfortable. I did not alter the front piece at the princess seams. Lovely spring dress... great job! I LOVE your dress. You nailed it! Really cute, captures the feel of the era, but can be worn today. This is so sharp, I love the floral with the linen. Time for me to revisit this pattern!